Bob M6DFY, Ian G6TEQ, Alan G2DXU, Ian 2E0IDP, Pam G7SME, Ann M6RWJ, John 2E0JNP, Ted G7UGT, Derek G8KOV. Steph G4XKH is taking the picture. Pam Helliwell G7SME, the RSGB Region 11 district manager presented Riviera ARC with a trophy for winning the Club of the Year award for the Small club category for the Southwest & Channel Islands. John Perry M6GSW, the club chairman gratefully accepted the trophy on behalf of the club. excited that RARC has received this accolade. 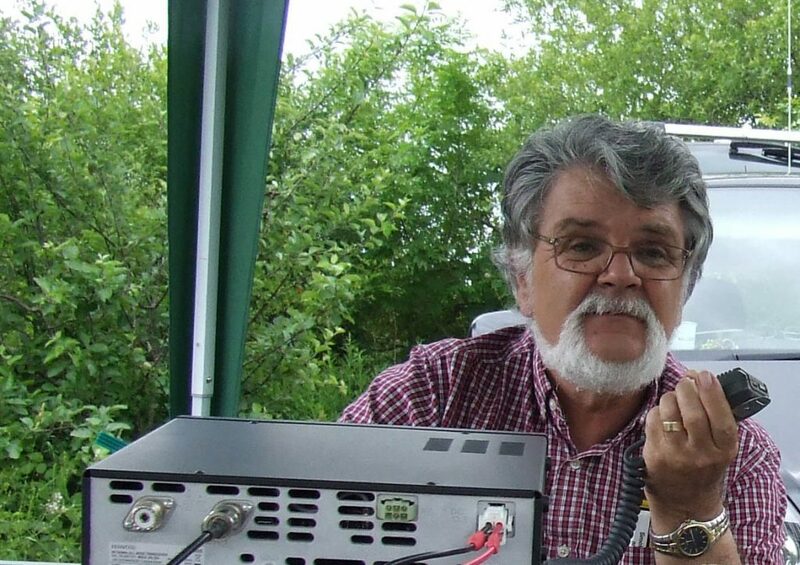 This entry was posted in Riviera ARC, RSGB Club of the Year, RSGB Club of the Year and tagged Amateur Radio Useful Links, RARC, Riviera ARC, RSGB, Torbay, Torquay on 29/05/2015 by G4XKH. 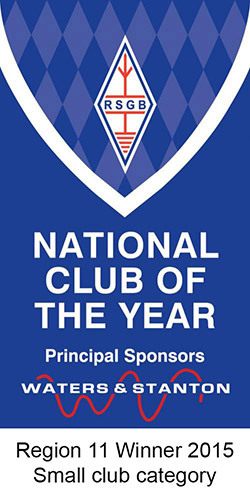 (South West & Channel Islands) in the Small Club category. Well done everyone for working hard together to get us this award. We would also like to offer our warmest congratulations to Poldhu ARC in Cornwall who won in the main category. This entry was posted in Awards, Riviera ARC, RSGB Club of the Year, RSGB Club of the Year and tagged Region 11, RSGB Club of the Year, South West & Channel Islands on 19/03/2015 by G4XKH. The Radio Society of Great Britain celebrates its centenary in 2013 and among events planned to mark the occasion are a special RSGB Centenary Callsign and an award to go with it, the RSGB Centenary Award. The RSGB Centenary Award will be open to all radio amateurs throughout the year. The RSGB Centenary Callsign will tour the UK over a period of 12 months including the Centenary day (5 July) at the National Radio Centre, Bletchley Park. The award will comprise of four levels: Bronze – Silver – Gold – Platinum. All that is required is a copy of your log showing the days/times that you worked the required number of special events. Bronze needs 5 contacts at different locations, Silver is 15 contacts at different locations, Gold is 25 contacts at different locations and Platinum is 30 contacts at different locations plus the NRC station on Centenary weekend (5/6 July). The award will be open to all radio amateurs and SWLs worldwide. Riviera ARC will be hosting the RGSB Centenary Callsign G100RSGB for 2 days during the period 26 Mar 2013 – 22 Apr 2013 (dates to be announced), and will issue a special QSL card for stations making contact during those 2 days. This entry was posted in Awards, Events, G100RSGB, Riviera ARC, RSGB Centenary Award, SES and tagged G100RSGB, RSGB Centenary, RSGB Centenary Award, RSGB Centenary Callsign on 27/09/2012 by G2DXU. There are 3 awards relating to the UEFA European Football Championships which take place in June/July in Poland and Ukraine. The special event stations are on air from 1 June – 5 July 2012. 50 QSOs with the 16 nations in EURO 2012, including at least one of each of the 16 nations. 20 points from working Special Event Stations from Kharkov. Calls: EM2012LL, EM2012LS, EM2012LWY, EN2012LTX, EO2012LBL, EO2012LD, EO2012LE, EO2012LX, EO2012LF, EO2012LN. This entry was posted in Euro 2012 and tagged Croatia, Czech Republic, Denmark, England, Euro 2012, football, France, Germany, Greece, Ireland, Italy, Netherlands, Poland, Polska, Polski, Portugal, RSGB, Russia, Spain, Sweden, Ukraine, Wales on 01/06/2012 by G2DXU.